The Golden Lane Lone Star Blues Revue are: Grammy Nominated Harp Ace: Mark Hummel Guitar Legends: Anson Funderburgh (Anson and the Rockets) Little Charlie Baty (Little Charlie and the Nightcats) Bassman Deluxe: R.W. Grigsby (Rusty Zinn, Mike Morgan) and Drummer Extraordinaire: Wes Star (Omar and the Howlers) ?... Great! 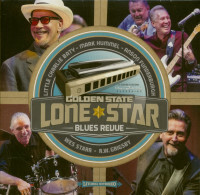 Customer evaluation for "Golden State Lone Star Blues Revue (LP)"